In this review, we aim to summarize available data on vitamin D in neonates critically. Vitamin D is a fat-soluble, steroid hormone with pleiotrophic effects not only on bone metabolism but also on optimal functioning of many organ systems. Deficiency is considered when 25-hydroxyvitamin D value is ˂20 ng/ml. Vitamin D deficiency is a global problem that prevales even in developed countries. Vitamin D deficiency is closely related to multiple disease states. It may influence obstetrical complications as preeclampsia, gestational diabetes, bacterial vaginosis, preterm birth, low-birth weight and cesarean section. Long-term outcomes in the offspring including asthma, multiple sclerosis, schizophrenia, abnormal neurocognitive outcome, type 1 diabetes mellitus, and insulin resistance can occur with vitamin D deficiency. Trials are needed to assess the effect of vitamin D supplementation and its dosage during pregnancy and lactation on clinical outcomes. The American Academy of Pediatrics recommends 400 IU/day of supplemental vitamin D for breastfed infants from the 1 st day of life. Preterm infants born <32 weeks are at a greater risk to develop vitamin D deficiency. The European Society for Pediatric Gastroenterology, Hepatology and Nutrition has recommended higher intakes of vitamin D of 800-1000 IU/day for preterm infants. However, studies are needed to evaluate the dose and duration of vitamin D supplementation to preterm infants. Introduction: Skin manifestations are common in neonates. Most of them are considered transient. It is important to differentiate these lesions from pathologic ones to avoid unnecessary diagnostic or therapeutic procedures. The present study was designed to evaluate the frequency of skin manifestations and its related factors in neonates born in Zanjan, Iran. 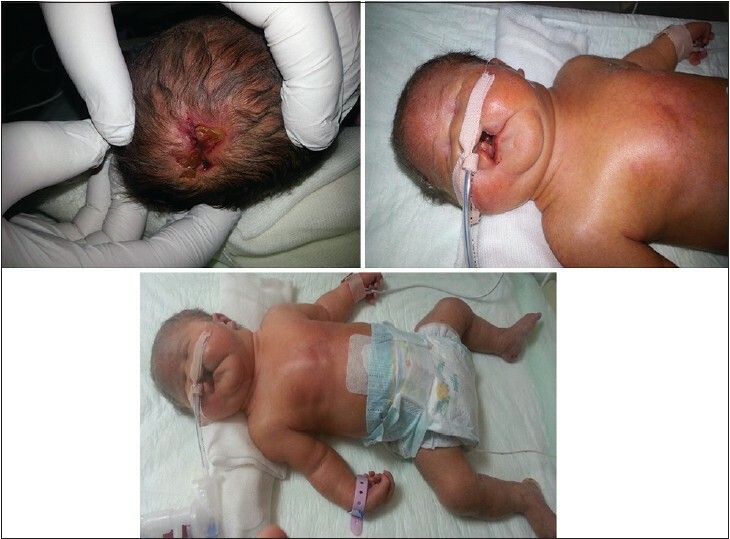 Materials and Methods: All neonates born in the teaching Moussavi hospital in Zanjan, Iran from December 2010 to July 2011were examined for skin manifestations. The influences of variables such as gestational age, gender, route of delivery, skin and hair color, placental status, history of drugs used by mother and neonatal age by hours were evaluated. Data were collected by using SPSS software 16 and Statistical analysis was performed by Chi-squared test. Results: Five hundred neonates were examined. In 95.6% at least one lesion was found. The most common skin lesions were epstein pearl (60.4%) and Mongolian spot (56%) respectively. Mongolian spot was related significantly to gestational age and black hair color (P = 0.03). Epstein Pearl was significantly related to normal delivery (P = 0.02). There were a significant relationship between sebaceous hyperplasia and increasing gestational age (P = 0.004), and erythema toxicum was significantly related to cesarean section (P = 0.02). Conclusion: In this study the incidence of skin manifestations and epstein pearl were similar to other studies. We found significant relationship between epstein pearl and erythema toxicum with type of delivery. Sebaceous hyperplasia and Mongolian spot were related to gestational age. Background: Late preterm birth accounts for three-quarters of all preterm births. They are at increased risk of multiple respiratory morbidities. The optimal respiratory management in these babies is not standardized. Objective: The objective was to compare intubation, surfactant, and extubation to nasal continuous positive airway pressure (INSURE + NCPAP) versus NCPAP in the management of respiratory distress syndrome (RDS) in late preterm neonates. Methods: In this prospective observational cohort study, all late preterm neonates with RDS were enrolled. Infants were divided into two study groups, INSURE + NCPAP and NCPAP. Outcome measures: Primary-To compare INSURE + NCPAP versus NCPAP in late preterm neonates with RDS in terms of failure. Secondary: To compare the two groups in terms of duration of noninvasive ventilation, duration of supplementary oxygen, neonatal intensive care unit stay, mortality, and any one or more complications. Results: A total of 55 late preterm neonates with RDS were enrolled. Twenty-eight received INSURE + NCPAP, and 27 received NCPAP. There was statistically no difference between the two groups in terms of failure (P - 0.66). The duration of noninvasive ventilation was significantly less in INSURE + NCPAP as compared to NCPAP group (32.53 ± 23.18 h vs. 56.07 ± 45.91 h, P - 0.01). The duration of supplementary oxygen was significantly less in INSURE + NCPAP versus NCPAP group (36.2 ± 15.85 h vs. 55.69 ± 29.08 h, P - 0.003). Conclusion: INSURE + NCPAP therapy may be of significant benefit in late preterm neonates with RDS; additional evidence is needed from large multicenter randomized trials. Context: Jaundice is common in preterm infants and requires frequent blood sampling for total serum bilirubin (TSB) measurements. Transcutaneous bilirubin (TcB) measurement is a noninvasive method to determine TSB, although its accuracy is less conclusive in preterm than in term infants. Aims: The aim was to determine the correlation and agreement between TcB and TSB in jaundiced Saudi preterm infants. Settings and Design: Design - Prospective study. Setting - Neonatal intensive care unit at a tertiary university hospital. Subjects and Methods: Jaundiced preterm infants 24-36 weeks gestational age (GA). JM-103 device and direct spectrometry were used to measure TcB and TSB, respectively. TcB measurements were obtained at the forehead ± 15 min of blood sampling for TSB for every clinically jaundiced preterm infant. 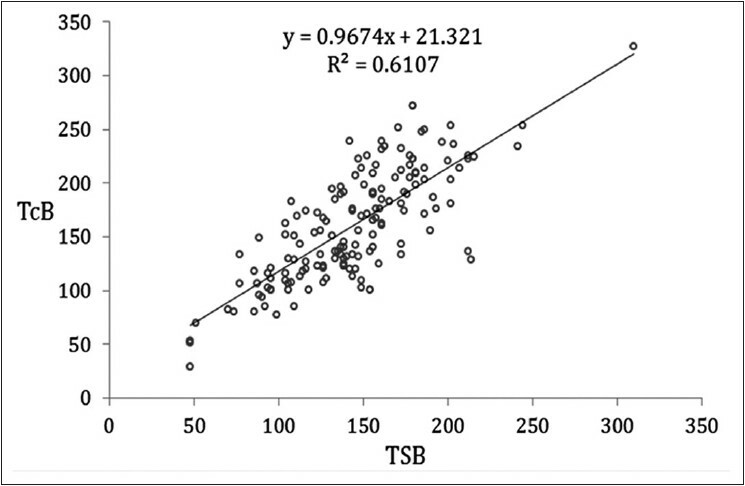 Statistical analysis used: The correlations (r) of TcB-TSB values were performed by Pearson linear regression. The bias and 95% limits of agreement were analyzed using Bland-Altman method. Results: A total of 152 paired TcB-TSB readings for 91 jaundiced preterm infants were obtained. Mean birth weight (BW) ± standard deviation was 1690 ± 500 g, mean GA was 32.2 ± 3.1 weeks, mean postnatal age was 62 ± 40 h, (r) were 0.78 and 0.88 and 0.87 for all the preterm infants and ≤ 32 weeks and very low BW, respectively. The bias was 16.6 μmol/L, 95% limit of agreement was (−46.3-79.9 μmol/L). Conclusions: JM-103 device is effective in estimation of TSB. The correlation is inversely proportional to BW < 1500 g and GA ≤ 32 weeks. It tends to mildly overestimates bilirubin values, which make it safe. Its use can reduce blood sampling. Aim : The goal of this study is to verify whether the Locomotor quotient of Griffiths Mental Development Scales (GMDS) can be considered a useful tool of screening for neurological disabilities in conjunction with objective tests. We explored whether there exists an association between the specialized medical examination and the GMDS Locomotor score at 6 and 12 months, and subsequently if it is possible to identify predictive factors at the birth of motor disability development. Materials and Methods : The sample includes 35 children born before the 32 nd gestational week with a birth weight less than 1500 g. The neurological examination was performed by an experienced physician using the criteria outlined by Milani-Comparetti and Amiel-Tison, while infant level of development was assessed using GMDS. Results : Significant correlation was found between the medical diagnosis and the GMDS at 6 and 12 months. The intraventricular hemorrhage of III-IV degree and periventricular leukomalacia were confirmed to be predictive risk factors for the development of motor disability. Conclusion: Locomotor quotient of GMDS could be used in conjunction with the standard neurological assessment to screen for motor disabilities. Background and Objectives: The Kangaroo mother care (KMC) method is the best care method that can provide the newborn's skin normal contact with the mother's skin for all newborns, especially the premature or underweight. However, this method has not still become common in some countries and many hospitals in Iran. Thus, the present study aimed to determine the impact of KMC method on vital signs and arterial oxygen saturation of newborns compared to the incubator care method in order to facilitate this method. Materials and Methods: This clinical trial study was performed on 53 neonates who have been hospitalized in Neonatal Intensive Care Unit; they were randomly divided into two case and control groups. The KMC was conducted on newborns in the study group for an hour each day for 3 consecutive days. The vital signs including temperature, respiratory and heart rate per minute, and the arterial oxygen saturation rate were measured and recorded before, during and after caring process in both groups and then were compared and analyzed. Results and Conclusion: The results showed that the average temperature variations and the arterial oxygen saturation rate between the two groups had significant differences in 3 days of examining (P < 0/056, P = 0/00), but there were no significant differences in the mean heart and respiration rate between the two groups (P = NS). Thus, the Kangaroo care method is effective in the improvement and stabilizing of vital signs of newborns, and nurses can train this method to mothers. Background: Respiratory efforts and work of breathing may be influenced by the mode of ventilation used in the respiratory support of the very low birth weight (VLBW) infants (birth weight <1500 g). 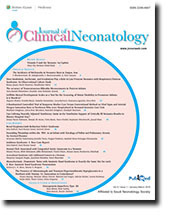 Utilizing neurally adjusted ventilatory assist (NAVA) technology in the care of VLBW infants in neonatal intensive care unit (NICU) setting may decrease work of breathing and the energy expenditure which can potentially improve the pattern of weight gain in VLBW neonates and results in expedited discharging these infants home form NICU. 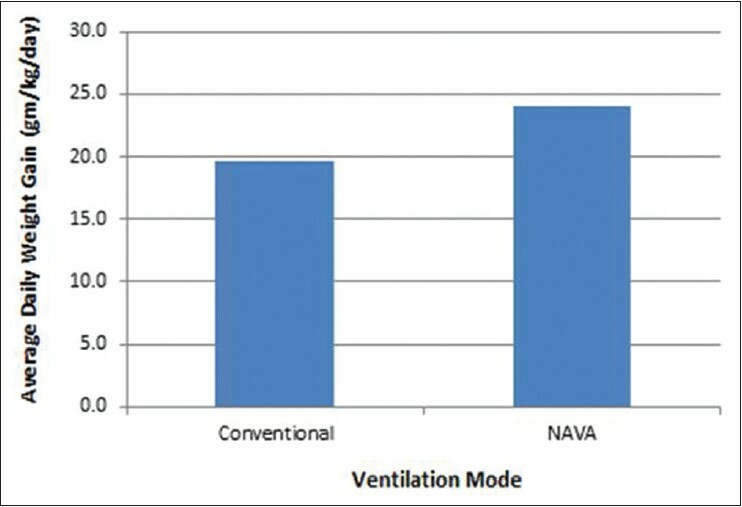 Aims: This study examines daily weight gain on NAVA ventilation, and compares it to other currently available modes of ventilation used on VLBW infants. Subsequent difference in hospital length of stay (LOS) between the two groups is evaluated. Materials and Methods: A retrospective analysis of inpatients hospital electronic medical records using one sample pairwise t-test statistical technique was performed to compare the patterns of weight gain and hospital LOS in seven VLBW infants who were consecutively ventilated by the conventional and NAVA. Results: A trend of a favorable effect of NAVA over conventional ventilation was demonstrated regarding weight gain of VLBW infants, which reflect financial savings by shortening the LOS at the hospital. Conclusion: This study presented the first insight on the financial impact of implementing this new technological innovation in the NICU by comparing the daily weight gain on NAVA technology compared to the traditional methods of ventilation. By studying this impact further in larger prospective studies, looking at variable factors that may affect neonatal growth, researched can develop more understanding of the effect of this technology on nutrition status and growth. 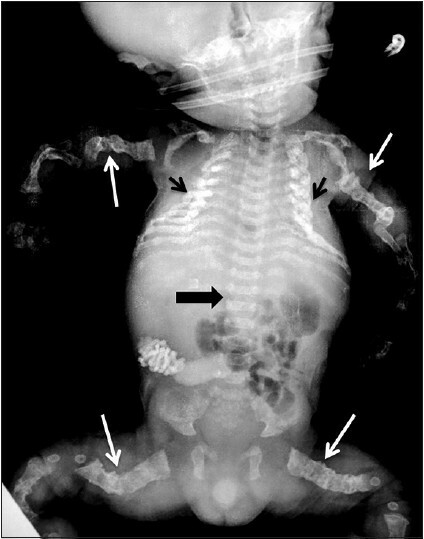 Renal dysplasia-limb reduction defects syndrome (RL syndrome), also known as Ulbright-Hodes syndrome, is a very rare autosomal recessive congenital disorder. We report a case of 26-year-old G 3 A 2 at 25 +5 week s of gestation who was referred to our department with severe oligohydramnios and fetal growth restriction detected in routine second trimester scan. She had consanguineous marriage with her husband. On sonography, severe oligohydramnios and growth restriction with fetal biometric measurements compatible with 19 weeks of gestation with additional bilateral renal dysplasia were confirmed. Based on these findings, a provisional diagnosis of lethal skeletal with renal dysplasia was made. The couple was counseled, and pregnancy was terminated at 26 weeks of gestation. Postmortem autopsy and radiological examination confirmed the diagnosis. This case report gives emphasis regarding the problem of congenital malformations and their early prenatal diagnosis, which will aid in an alternative option of termination of pregnancy when such an affected fetus is detected. Goldston syndrome is a rare condition characterized by cystic renal dysplasia and Dandy-Walker malformation (DWM). 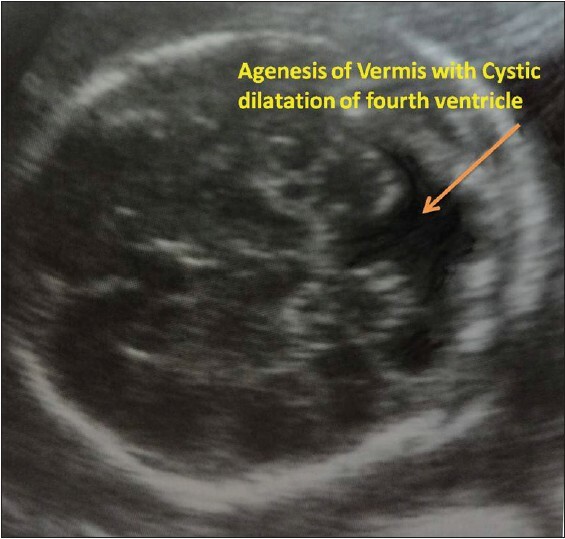 We present a case of antenatal ultrasound diagnosis of a fetus with Goldstan syndrome in a 24-year-old primigravida with a history of consanguineous marriage. Ultrasound showed severe oligohydramnios, DWM, bilateral enlarged multicystic dysplastic kidneys and massive fetal ascites. The diagnosis was made at 24 th week of gestation and medical termination of pregnancy was done after discussion with the couple in view of poor prognosis of the condition. A cleft sternum is a rare congenital anomaly. It can be isolated or combined with other defects particularly heart and vessel anomalies. We report a case of a newborn with a giant aortic aneurysm, admitted to our neonatal intensive care unit for respiratory distress. Acrocallosal syndrome (ACLS) is a rare genetic disorder having characteristic craniofacial abnormalities, distinctive limb malformations, and brain anomalies. Though the typical phenotypic features help the clinician to identify this syndrome at birth, few overlapping features with Joubert syndrome and hydrolethalus syndrome, could confuse the clinical picture. In this report, we describe a neonate with ACLS having additional features not described previously. The inheritance and overlapping clinical features with other disorders are also discussed. The aetiology of amniotic band syndrome (ABS) (Streeter's dysplasia, ADAM complex, amniotic deformities, adhesion, mutilation, amniotic band sequence, the amniotic disruption complex, annular grooves, congenital amputation, congenital constriction bands, transverse terminal defects of limb, aberrant tissue bands and amniochorionic mesoblastic fibrous strings amniotic bands) can present a wide range of clinical entities. 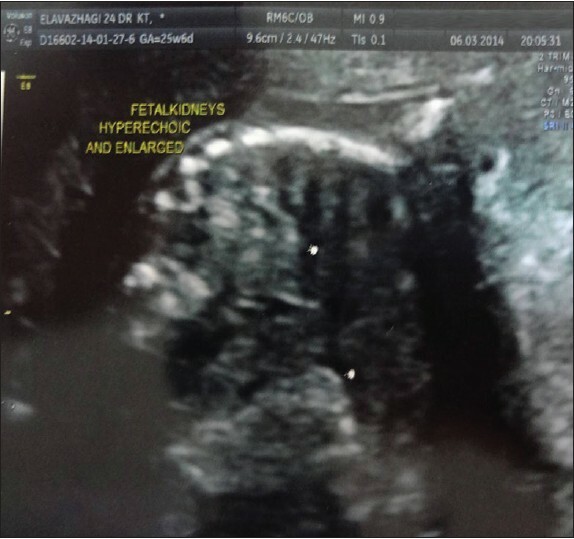 The reported case concerns monochorionic, diamniotic twins with ABS at exactly the same site, which is extremely rare, raising questions about the aetiology of ABS. The twins had suffered from twin to twin transfusion syndrome (TTTS), where intra-uterine laser therapy had been performed at 20 weeks. Trisomy 13 (T13) was first described by Patau et al. in 1960. It is generally considered to be lethal. It affects many systems. A review of the literature of T13 revealed four cases of hyperinsulinemic hypoglycemia (HH). It has never been associated with adrenomegaly. In this presentation, the association of adrenomegaly and hyperinsulinemia in a newborn with T13 is reported. A baby girl was born at the 40 th week of pregnancy. Due to respiratory distress and dysmorphic features she was admitted to the neonatal intensive care unit. During the follow-up in a patient, adrenomegaly and hyperinsulinemia were detected. According to reported cases in the literature, HH may rarely accompany T13. However, it has never been associated with adrenomagaly and transient HH. Our case is presented as a contribution to the literature. Osteogenesis Imperfecta Type IIA is a very rare congenital lethal form of skeletal dysplasia. We would like to highlight classical clinical and imaging features. Conventionally, the term Riga-Fede disease (RFD) has been used to describe traumatic ulceration that occurs on the ventral surface of the tongue, which may affect the feeding habits of the infants, depending on the severity of ulceration. 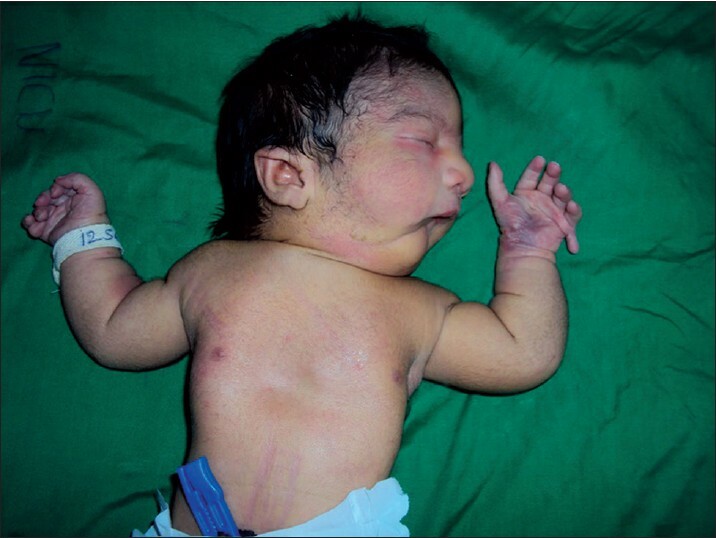 Here is a case of RFD in a 15-day-old male baby, which was managed conservatively with follow-up. 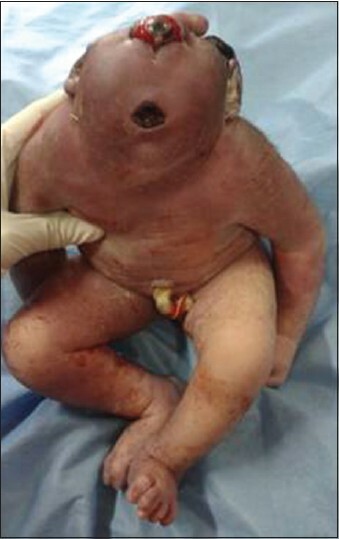 True cyclopia is the alobar type of holoprosencephaly in which the organogenetic development of the anterior brain and the midline mesodermal structures is suppressed. We are presenting a case of true cyclopia.